Marc Kinder is German and learnt to cook Caribbean cuisine from his Cuban girlfriend. 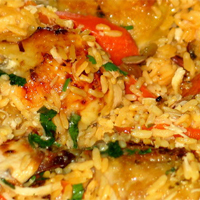 One of most beloved of chicken dishes in Cuba is arroz con pollo. Marc is delighted to share with Taste the Caribbean readers his recipe for what has now become his signature dish. Grill contents of ½ can of red pepper. Chop the spices (onion, garlic, cilantro, red pepper) and make a sauce with olive oil. Brown the chicken pieces and cook until they are slightly golden. Add the balsamic vinegar, tomato, and add achiote for colour. Add 1 tablespoon of salt, 3 cups of rice and 5 cups of water. Transfer to pressure cooker. Close the pot and start cooking on a high flame. After the pressure pan starts to beep, lower the heat and leave another 15 minutes more. Turn the heat off. Open the pan, and pour in half a small can of beer and stir the contents carefully so as not to break up the chicken. Leave it on a low flame and with the lid off for 5 minutes. Garnish with remainder of can of red pepper and serve. Note from Marc: Adjust the water volume if you want it to be drier or more liquid.